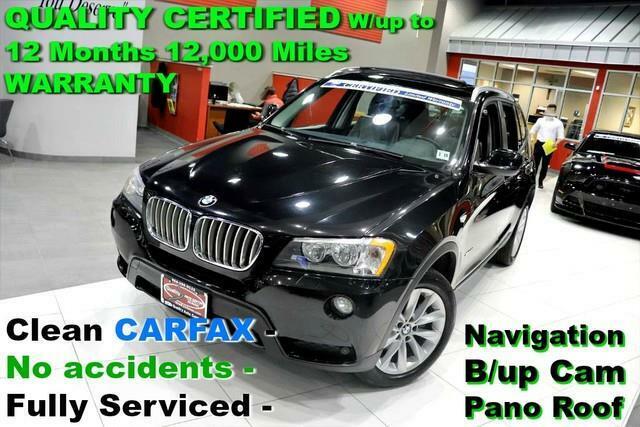 Clean Carfax - No accidents - Fully Serviced - QUALITY CERTIFIED up to 10 YEARS 100,000 MILE WARRANTY 2014 BMW X3 xDrive28i. This BMW includes: PARK DISTANCE CONTROL Rear Parking Aid PANORAMIC MOONROOF Generic Sun/Moonroof Sun/Moonroof Dual Moonroof COLD WEATHER PACKAGE Heated Rear Seat(s) Heated Front Seat(s) NAVIGATION SYSTEM Navigation System Telematics Hard Disk Drive Media Storage MP3 Player DRIVER ASSISTANCE PACKAGE Rear Parking Aid Back-Up Camera PREMIUM PACKAGE HD Radio Generic Sun/Moonroof Satellite Radio Power Door Locks Keyless Entry Passenger Adjustable Lumbar Sun/Moonroof Driver Adjustable Lumbar Dual Moonroof *Note - For third party subscriptions or services, please contact the dealer for more information. * Off-road or on the street, this BMW X3 xDrive28i handles with ease. Hit the gas pedal and put the engine power to all four wheels. With AWD, you'll have the greater performance right off the line, everytime you drive. Enjoy the drive without worrying about directions thanks to the built-in navigation system. Previous service records are included, making this BMW X3 extra special. Pre-owned doesn't have to mean used. The clean interior of this BMW X3 makes it one of the nicest you'll find. Fast, yet nimble, this highly refined automobile will turn heads wherever you go, provided of course, they even see you. Why go with a basic vehicle when you can have it all in this well-optioned BMW X3? Added comfort with contemporary style is the leather interior to heighten the quality and craftsmanship for the BMW X3 One of the things that makes this vehicle a great buy is it has brand new tires. When you see this car in person, you'll ask yourself When did WOW become a color of paint? Sophistication, performance, style and class all wrapped up in this rare BMW X3. More information about the 2014 BMW X3: The X3 is one of the quickest and most nimble-handling of the compact luxury-brand crossovers yet it's also one of the most fuel-efficient in 4-cylinder xDrive28i form. The sensible yet stylish cabin strikes a great balance between plush comfort and practical family sensibilities, and it has one of the more comfortable back seats in its class while the number of useful high-tech features and driver aids is impressive. Interesting features of this model are very fuel-efficient compared to other crossovers (28i), Quick and nimble, comfortable, well-appointed cabin, and long list of technology features and upgrades No Credit / Bad Credit / No Paystubs, No problem !! ! All Approved ! Everyone drives ! CLEAN, GORGEOUS, LOW MILES, SHOWROOM CONDITION. CALL NOW QUALITY CERTIFIED up to 10 YEARS 100,000 MILE WARRANTY , To Certify a vehicle, there will be an additional cost for Certification. CALL NOW For details. STUNNING AGGRESSIVE LOOK ON THIS BEAUTIFUL--Call today to schedule a test drive... Good Credit/Bad Credit/No problem!!!! Get paid cash? No problem!! 100% Credit Approval with interest rates starting at 2.49% for qualified customers, our rates will not be beaten. We price our cars at wholesale price to guarantee the best deals for our customers. Our inventory moves quick, please call to confirm the availability of the vehicle of your interest Springfield location 973-564-0112. This vehicle is located at our SPRINGFIELD location. Come visit our new showroom in Springfield NJ. This 2014 BMW X3 xDrive28i is offered to you for sale by Quality Auto Center. The BMW X3 xDrive28i offers a fair amount of utility thanks to its advanced features and unique styling. It's also quite sporty, and injects an ample amount of handling chutzpah into the ridin'-high body of a family-friendly SUV. This BMW X3 xDrive28i comes equipped with all wheel drive, which means no limitations as to how or where you can drive. Different terrains and varying weather conditions will have little effect as to how this vehicle performs. This is the one. Just what you've been looking for. More information about the 2014 BMW X3: The X3 is one of the quickest and most nimble-handling of the compact luxury-brand crossovers yet it's also one of the most fuel-efficient in 4-cylinder xDrive28i form. The sensible yet stylish cabin strikes a great balance between plush comfort and practical family sensibilities, and it has one of the more comfortable back seats in its class while the number of useful high-tech features and driver aids is impressive. Interesting features of this model are very fuel-efficient compared to other crossovers (28i), Quick and nimble, comfortable, well-appointed cabin, and long list of technology features and upgrades No Credit / Bad Credit / No Paystubs, No problem !! ! All Approved ! Everyone drives ! CLEAN, GORGEOUS, LOW MILES, SHOWROOM CONDITION. CALL NOW QUALITY CERTIFIED up to 10 YEARS 100,000 MILE WARRANTY , To Certify a vehicle, there will be an additional cost for Certification. CALL NOW For details. STUNNING AGGRESSIVE LOOK ON THIS BEAUTIFUL--Call today to schedule a test drive... Good Credit/Bad Credit/No problem!!!! Get paid cash? No problem!! 100% Credit Approval with interest rates starting at 2.49% for qualified customers, our rates will not be beaten. We price our cars at wholesale price to guarantee the best deals for our customers. Our inventory moves quick, please call to confirm the availability of the vehicle of your interest Springfield location 973-564-0112. This vehicle is located at our SPRINGFIELD location. Come visit our new showroom in Springfield NJ.